"This comprehensive and practical handbook will provide a very accessible source of detailed information for everyone in the field of communicable disease control." 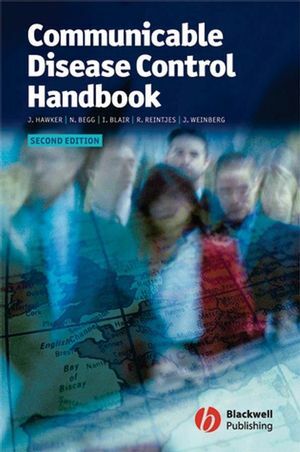 "This handbook will be a valuable resource for all those who are interested in control of communicable disease, including public-health physicians, epidemiologists, infection control nurses, microbiologists and those training to work in these related fields." "This book fulfils all the needs of a practical handbook, being easy to use and packed with practical information." "This would be the first book to reach for in any number of day-to-day or crisis situations in communicable disease control." "If you undertake on-call public health duties, just buy the book." 1.1 How to use this book. 1.2 Basic concepts in epidemiology and control of infection. 2.5 Rash and fever in children. 2.6 Illness in returning travellers. 2.9 Infection in the immunocompromised. 3.7 Chickenpox and shingles (varicella-zoster infections). 3.12 CJD and other Human Transmissable Spongiform Encephalopathies. 3.22 Enterococci, including Glycopeptide-resistant enterococci (GRE). 3.24 Escherischia coli O157 (and other E. coli gastroenteritis). 3.26 Gonorrhoea, syphilis and other acute STIs. 3.36 Haemophilus influenzae type b (Hib) infection. 3.50 MRSA (methicillin-restisant Staphylococcus aureus). 3.56 Parvovirus B19 (fifth disease). 3.63 Respiratory syncytial virus (RSV). 3.68 Severe Acute Respiratory Syndrome (SARS). 3.82 Typhus, other rickettsial infections and Ehrlichiosis. 5. Bites, stings and venoms. Section 4: Services and Organisations. 4.1 Administrative arrangements for communicable disease control. 4.2 Surveillance of communicable disease. 4.3 Managing infectious disease incidents and outbreaks. 4.6 Risks to & from healthcare workers. 4.7 Co-ordination of immunisation services. 4.8 Co-ordination of services for HIV infection in the UK. 4.9 Co-ordination of services for tuberculosis control. 4.10 Travel Health and Illness in returning travellers. 4.11 Surveillance & investigation of environmental hazards. 4.12 Managing acute chemical incidents. 4.13 Managing acute radiation incidents. 4.14 Planning for deliberate release of biological, chemical or radiological agents. 4.17 Clinical governance and audit. Section 5: Communicable Disease Control in Europe. 5.1 International collaboration in Europe. Appendix 1: Useful addresses telephone numbers. "A well organized and supremely practical book to have at hand when on-call for public health or indeed microbiology and infectious diseases"
"A very pragmatic, well organized handbook that has been well thought out. It should be read thoroughly and kept on the bedside table to consult as necessary." "Each section of the book is clearly written, and laid out so that key information is readily apparent to the reader in a hurry. An excellent text, of use to infection control nurses in acute and community settings, as well as health protection staff." "...(this book) seems to me to incorporate all that is best in the tradition of (the CDSC) - sound science, attention to detail and an essentially practical approach." "This outstanding and I suspect unique handbook is packed with useful information. I believe it will prove to be an essential resource for those, not only within the United Kingdom but throughout Europe, who have responsibility for the identification and control of infectious disease. It will also be an indispensable text for students aspiring to a career in this important field."